All the photos in these posts were taken by a very unprofessional photographer – me. You can easily find much better ph0tos of this hospital. 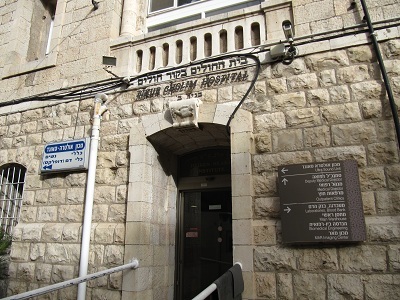 Bikur Cholim (literally “Visiting the Sick”) Hospital dates from 1826. The current building was completed in 1925 and was one of the first to be erected in what is now the city centre. It still functions as a hospital, having survived artillery fire and severe financial problems. At least the entrance looks more inviting than other hospitals ! oh I am enjoying this. It’s got real character, hasn’t it. I know it’s cost effective to build those huge plastic hospital buildings but that one looks like they’ll really care for you. Thanks for putting me right about my bus memories. Hope my memory performs better than that for the duration of April. It wasn’t my intention to put you right – just to say how it was in my part of the UK. It’s inspiring that it’s still functioning as it was so long ago despite all that’s happened to it. I love the fact that it’s been around so long, and yet still looks clean! I like your theme for the Challenge, Miriam. Enjoying the information and the photos!